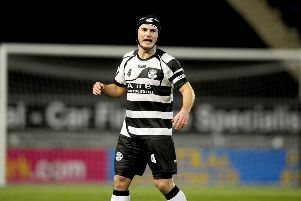 East Stirlingshire staged an unlikely late fightback to claim all three points as they beat Edinburgh University at East Peffermill on Saturday despite Scott Gray’s second half dismissal. Shire’s title dreams for this season may well be over but last weekend’s remarkable comeback against high flying Kelty Hearts further underlined the quality Derek Ure’s side still possesses. However, a visit to Edinburgh University looked to be yet another tight encounter between the two sides having played out a 2-1 victory for Edinburgh in the reverse fixture. Despite playing into some harsh winds for much of the first half, Shire dominated the opening exchanges with Rangers’ loanee Scott Gray proving particularly problematic for the sluggish Edinburgh defence. Shire’s wastefulness in front of goal was punished, however, when Edinburgh University’s first attack of the game produced the first goal with Mark Waters the beneficiary of some poor Shire defending to give his side the lead. Waters’ goal seemed to derail what had been a promising start by Shire as a combination of misplaced passes, poor finishing and windy conditions stifled the away side’s search for an equaliser before half time. Shire’s task became even more difficult after the interval when Scott Gray, who had been a rare bright spark for Shire in an otherwise forgettable half, was dismissed for a tackle that was adjudged to have been reckless by the referee. Gray’s dismissal signalled a shuffling of the pack from Shire as they introduced perennial fan favourite Andy Rodgers in the hope of repeating last week’s heroics. The risk paid off as a free-flowing Shire counter attack, spearheaded by Ross Willox, resulted in an equaliser with Ross Allum rounding it off in typical fashion from inside the six-yard box. Edinburgh University, who had controlled the second half, suddenly found themselves on the ropes with Shire exposing space that had been well patrolled by Uni’s defence prior to the equaliser. The pressure eventually told with five minutes to play when Andy Grant, showing tremendous bravery, nodded home Rodgers’ in-swinging corner to seal a hard fought three points for Shire. Shire’s win lifts them up to 8 th in the table and while they find themselves 25 points adrift of East Kilbride in first, Derek Ure will hope that this victory will lay the foundations for a strong end to the season.